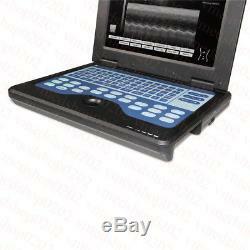 CMS600P2 Digital Laptop Portable Ultrasound Scanner Machine. 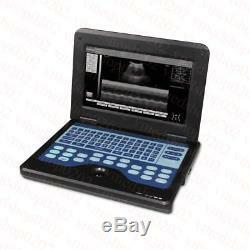 The notebook type CMS600P2 is a full digital B-Ultrasound diagnostic system. 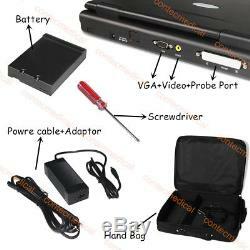 It adopts embedded operating system, which greatly optimizes the product performance. The system is taken more conveniently for its high effective data processing ability, pop-up menu and keyboard design. It includes rich measuring software packages that satisfy the clinic diagnostic need fully. The device which adopts linux embedded operating system, has well compatibility, transplantable character, and flexible expansibility. It adopts advanced full digital beam-forming, real time dynamic aperture, real time dynamic receiving apodization, real time dynamic receive focusing, frame correlation, modern image processing technology etc. The system can be taken conveniently for notebook type, built-in battery, high integration of unit, small volume, light weight. 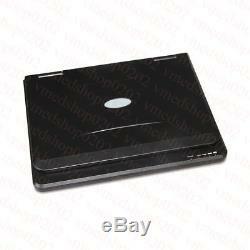 It adopts touch type folding keyboard, flexible and shortcut trackball operation, which greatly quicken the test speed. Neat and convenient image managing function which can print and export report. 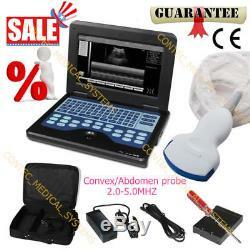 It includes rich measuring software packages:obstetrics, gynecology, cardiology, urology, small parts. Many probes can be chosen, and wide application can satisfy the clinic diagnostic need fully. Near gain, far gain and total gain can be adjustable alone. Can be connected to the video printer. 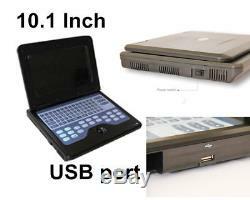 Display mode:B, 2B, 4B, B/M, M. Monitor:10.1 inch TFT LCD. Lateral resolution:2 mm (near field) 4 mm (far field). Axial resolution:2 mm (near field) 2 mm (far field). Horizontal geometric position precision:5%. Vertical l geometric position precision:5%. Zoom:0.9, 1.0, 1.1, 1.2, 1.3, 1.5, 2.0. Focus:The number and position can be adjustable. Assistant tool:Puncture guide and histogram. Obstetrics, gynecology, cardiology, small parts, urology etc. Measurement:Distance, circumference, area, volume, angle, ratio, slope etc. Support Chinese, English language interface display and input. The management interface menu, Chinese and English operating systems, image processing default and a key function of optimization. Measurement formula can be set up differently according to the different race. Comment:Date, time, name, hospital, number, frame rate, depth, gain, dynamic range, frame correlation, frequency etc. Image processing:Controllable frame correlation, gamma correction, histogram. Image conversion:Up and down, left and right, black and white. Screen comments function in both Chinese. 3.5MHz convex probe, 2.0MHz5.0MHz. C3.5-80R60(THI/2.0/2.5/3.5/4.0/5.0). Linear probe, 5.0MHz10.0MHz. L7.5-80L40(THI/5.0/6.5/7.5/8.5/10.0) Applications: Small part examination. 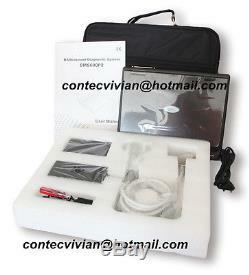 6.5MHz endo-vaginal probe, 5.0 MHz8.5 MHz. E6.5-80R13(THI/5.0/6.5/7.5/8.5) Applications: Obstetrics and gynecology examination. C3.5-80R20(THI/2.0/2.5/3.5/4.0/5.0) Applications: Cardiology examination. 7.5 MHz rectal Linear Probe Probe Frequency:5.0-10.0MHz A7.5-80L40(THI/5.0/6.5/7.5/8.5/10.0) Applications: Animal examination. Dimension:292 mm232 mm45 mm. Weight:2.3 kg (include probe). The sale of this item may be subject to regulation by the U. Food and Drug Administration and state and local regulatory agencies. The Fingertip Pulse Oximeter is registered on the Australian Register of Therapeutic Goods (ARTG) with the code 197923, and certified by FDA of United States and CE, TUV of Europe. 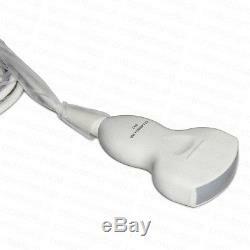 The Fingertip Pulse Oximeter that is FDA 510K Approved. We promise we will give you a satisfied answer, thank you for your understanding! 100% satisfaction is our goal! If you have a defective item, you want to return or discount. Contec Medical Systems focusing on research, manufacture and distribution of medical instruments, was founded in 1992 as a high-tech company. At present there are more than 1200 employees in our company. Our product line covers a wide range of 13 categories. Most of the domestic hospitals are our customers. Contec hopes to cooperate with international companies to supply more innovative design and advanced technology products. We sincerely welcome you to become one of our global partners. We are looking forward to establishing a successful business relationship with you. Address(US):1440 Chase Avenue, Elk Grove Village, Illinois 60007 United States. The item "CE&FDA, Portable laptop machine Digital Ultrasound scanner, 3.5M Convex probe, New" is in sale since Thursday, July 21, 2016. This item is in the category "Business, Office & Industrial\Healthcare, Lab & Dental\Handpieces & Instruments\Otoscopes & Ophthalmoscopes". 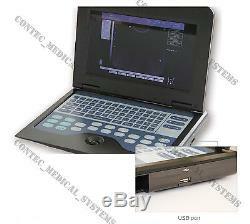 The seller is "contec_medical_systems" and is located in qinhuangdao. This item can be shipped worldwide.